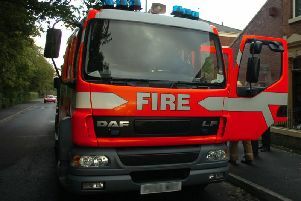 A fire which destroyed a primary school’s summer house is being treated as suspicious. Two fire engines and crews from Preston and Bamber Bridge responded to the blaze at St Joseph’s Catholic Primary, Bournes Row, Hoghton, this afternoon. Firefighters used a hosereel jet on the 5m x 2m wooden structure with a straw roof in the playground. The incident happened at around 3.15pm.